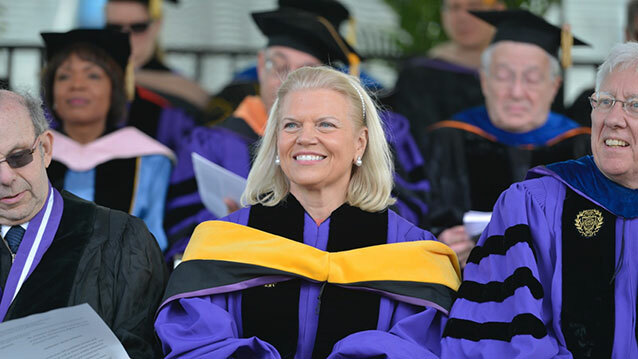 As the current chair, CEO and president of IBM, Virginia "Ginni" Rometty has fended off criticism of Big Blue's sinking revenues since becoming its first woman CEO in 2012. But she's also garnered praise for attempting to haul the 104-year old company out of the machine age and into the data era, with an emphasis on cloud-based computing and analytical services. Beginning as an electrical engineer and then working steadily in sales and marketing at IBM, Rometty has climbed the ladders of the tech world in a way that she hopes her company might imitate, with an eye on both the near- and far-term future. Often named to the "most powerful" business lists in magazines like Fortune and Forbes, Rometty is also a sought-after public speaker. Her talks are mostly in industry settings like the Consumer Electronics Show, where earlier this year she talked about her company's latest technology with a little of that engineer's spark. She's also comfortable in roundtable talks and one-on-one interviews, where she's become famous for repeating the mantra, "Growth and comfort do not coexist." As the commencement speaker at Northwestern University last spring, Rometty kept it simple and memorable, using personal stories and professional predictions to great effect. What can you learn from this famous speech? Find a structure for your speech. This commencement address uses the venerable rule of three in its construction, with Rometty offering three vignettes from her life to illustrate her overall message to the graduates. The story of her single mother's career track, her husband's encouragement to take a promotion, and her surprise at watching IBM's Watson technology on Jeopardy! all fit into the central theme of not allowing others to define you. And by signaling ahead of time that her talk will have three examples, she builds some anticipation into the speech while the audience waits for her to reveal the third "significant other" who taught her a career lesson. He sat and listened patiently to my story, like he always does. And then he looked at me and he said one thing. He said, 'do you think a man would have answered the question that way?' He said, 'I know you. In six months you'll be ready for something else.' And you know what? He was right. And I went in the next day and I took that job. Be relevant for your audience and your occasion. For every commencement, there's a danger that the speaker has been chosen just because she or he is a famous and available alumni member--without considering what the speaker might have to add to the occasion. Rometty does a deft job of delivering a speech about exactly what a graduating audience wants to hear: the future. She describes that future from a vantage point that only she possesses, as a leader in the 21st century of data and cognitive computing. The speech correctly targets her audience and promotes the leading edge of her business-what more could a CEO offer at a commencement?